SCVHistory.com JN4102b | Pre-Valencia | Lillian Duran at Newhall Land Irrigation Reservoir, 1940s. 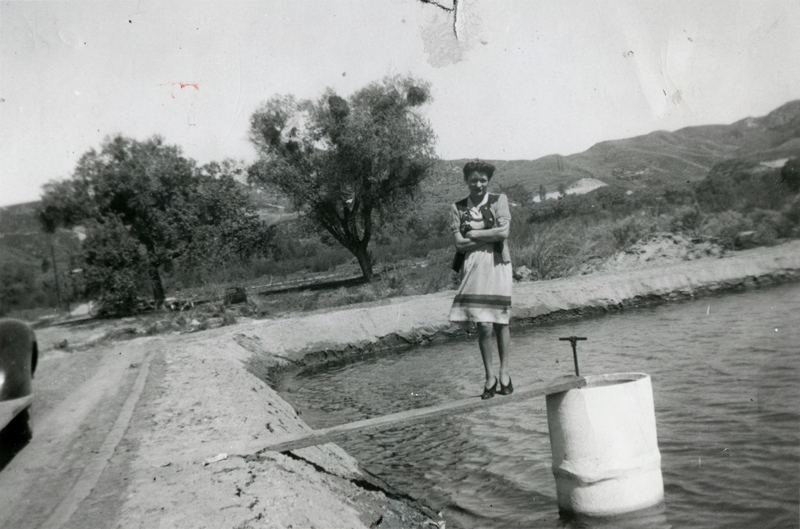 If she's not careful, Lillian Duran might fall into the irrigation reservoir her brother-in-law built for The Newhall Land and Farming Co. at the approximate location of today's county Civic Center (Valencia Boulevard and Magic Mountain Parkway). From this point, water was pumped to the agricultural fields on the Newhall Ranch (which is what Valencia was called before it was Valencia). Lillian and her husband, Arthur Duran, were "just visiting" Arthur's brother Samuel Duran in the 1940s, but fortunately they stopped long enough to take some pictures of things we rarely see. Samuel Duran (b. 2-19-1903, d. 1-19-1970) came to Newhall in the mid-1930s from a ranch in Oxnard to work for Newhall Land. Samuel and his family lived in a company home on the Saugus-Ventura Road (now Magic Mountain Parkway and Highway 126), at what is now the southeast corner of Magic Mountain and Valencia. Samuel Duran stayed with Newhall Land until 1962-63 when he went to work at the Kings Ranch in Bouquet Canyon, then to Lancaster to farm alfalfa before returning to his native New Mexico. JN4102b: 19200 dpi jpeg from original 3x5-inch photograph | Online image only; archival scan on file.